This sketch, from the Simcoe records in Wolford, U.K., depicts a gunboat of 1794 built in Québec. 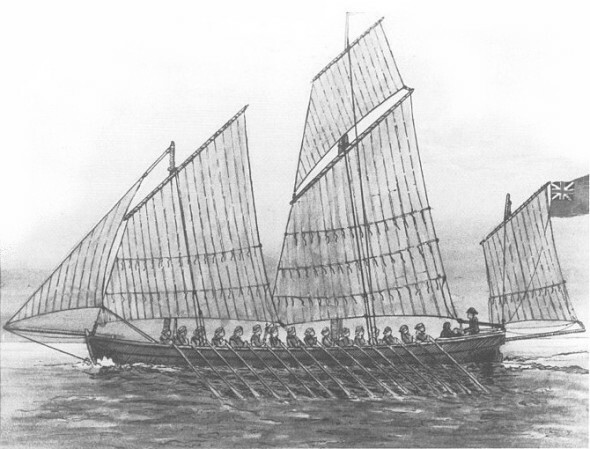 This vessel and another of the same or very similar type or design, possibly under the name Quebec or Glengarry, were used for the attack on Sackets Harbour, mounted out of Kingston on 29 May, 1814. Note that Malcolmson in "Lords of the Lake" gives the Quebec at 44 feet and 26 sweeps, lugger rigged, which makes this the most probable, although not exact, ressemblance.